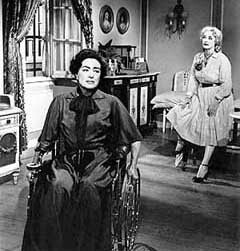 The Terror Trap: What Ever Happened to Baby Jane? Terror moviemaking in the early 1960s gave birth to a new film category. For lack of a better term, you might call it the "older woman exploitation horror" subgenre. Or Grand Guignol cinema. Actresses who had reached a certain age and were no longer getting romantic lead roles (and who wanted to continue acting) found work in these movies. The one that ignited this trend...the grandmother of them all...was undoubtedly What Ever Happened to Baby Jane? - a hugely successful and influential film. 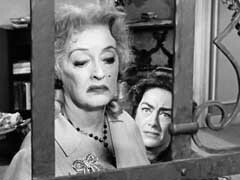 Robert Aldrich directed and it starred two of the biggest stars from a bygone era, Bette Davis and Joan Crawford. Although it is often viewed as a "camp" - Baby Jane should really be seen for what it is: a chilling psychological thriller. The movie opens in 1917. Baby Jane Hudson (Julie Allred) is a vaudevillian child star. 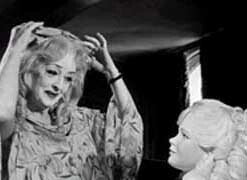 She performs to adoring crowds - and there's even a "Baby Jane" doll. A spoiled brat, Baby Jane's every whim is catered to and appeased by her doting stage father Ray (Dave Willock). Her jealous, but soft-spoken sister Blanche (Gina Gillespie) watches from the wings. Cut to the early 1930s. The roles are now reversed. Both sisters are movie stars but Blanche is the successful and glamorous one, while Jane's films have flopped. Unable to establish her talent as an adult actress, Jane has taken to drinking. One night after a party, one of the sisters is at the gate of her mansion. We see the other in her car step on the gas and smash into the gate, severely injuring her sibling. In the present, both Blanche (Crawford) and Jane (Davis) live in a decrepit old mansion. Blanche is crippled from the automobile accident. Despite her handicap, she is still a beautiful woman. However, because she cannot get around - she is usually holed up in her bedroom, watching her old movies on television. Jane is a shadow of her former self, still drinking and wearing days old caked on make-up. She is abusive towards her dependent sister. There are not many visitors at the house - except for their cleaning woman Elvira (Maidie Norman). Elvira fears for Blanche's safety because of Jane's erratic behavior. She even tells Blanche that her sister has been opening her mail and dumping it in the trash. When Jane finds out that Blanche intends on selling the house and putting her in a sanitarium, she responds by increasing her abuse. Blanche's beloved parakeet even disappears. Meanwhile, Jane gets the urge to go back into show business. In the living room, she sings her signature song from her childhood, I've Written a Letter to Daddy. But when she glances at herself in the mirror and sees the toll that age and alcohol have taken, she screams. Blanche hears this shriek and presses a buzzer in her room to get Jane's attention. Jane responds by cursing and ripping the phone out of the wall in Blanche's bedroom. She brings Blanche her lunch...and Blanche discovers what happened to her parakeet. Her sister serves the dead bird to her in a covered dish! Blanche is so frightened, she refuses to eat the next meals that Jane brings her. Jane is now planning a comeback. She drives out to the local newspaper to place an ad for a pianist. While she's out, Blanche attempts to get help. She writes a note and throws it out of her window. A neighbor, Mrs. Bates (Anna Lee) is outside - but she doesn't notice it. Nor can Mrs. Bates hear Blanche's cries...because her daughter Liza (played by Bette Davis's daughter Barbara Merrill) is playing loud music. Jane returns and while she is talking to Mrs. Bates, she sees the note near her foot. She picks it up and goes up to Blanche's room - where she mocks her by telling her that she will never leave the house, before dropping the piece of paper in the crushed woman's lap. Jane gets a response to her ad. An overweight mama's boy named Edwin Flagg (Victor Buono) makes an appointment to see her that afternoon. Jane gives Elvira the day off and brings Blanche her lunch. In one of the cinema's most macabre moments, Blanche lifts the cover off the dish to find a dead rat. Needless to say, this sends her into hysterics. Edwin shows up at the house. While Jane is showing him a scrapbook of her life and career, Blanche activates the buzzer. Enraged, Jane goes upstairs, she rips the buzzer apart and smacks her sister. Back in the living room, Jane rehearses - with Edwin at the piano. She does a grotesque version of "Daddy." Edwin tries to hide his disgust because he realizes he can take advantage of the situation. They agree to his salary and Jane drives him home. While she's out, Blanche discovers that Jane has practiced forging her signature and is writing checks. She tries to get down the stairs to use the telephone - but it is a difficult task because she can't use her legs. When she reaches the phone, she calls Jane's doctor and tells him that she needs help. But look out! Jane is back and finds Blanche talking to him. Blanche abruptly gets off the phone and Jane beats her senselessly, kicking her in the head and stomach. Disguising her voice as her sister's, Jane picks up the phone and calls the doctor back. She tells him not to come because "Jane" has found another doctor. The next day, Elvira arrives to work. Jane informs her that her services are no longer needed and she is dismissed. Jane then goes to the bank to withdraw her sister's money. Elvira pretends to get on a bus to go home. But instead, she returns to the house and discovers that Blanche's door has been locked. Jane comes back - and Elvira confronts her and demands the key to the room. Jane gives it to her...but as the maid enters the room, Jane hits her on the head with a hammer and kills her. She then puts the body in her car and disposes of it. The police call the house and tell Jane that a relative of her maid has reported her missing. She claims that she hasn't seen her employee for a week. Jane prepares to leave with her sister, fearing the police will discover what she's done. Edwin shows up to receive his first payment. Blanche is able to knock something down in her room and Edwin goes up and sees the condition she's in. Blanche begs for help...and Edwin runs out of the house to get the police. Desperate, Jane puts her sister in the car and drives to the beach. The next morning, the search is on for them. Elvira's body was found and there are bulletins on the radio. 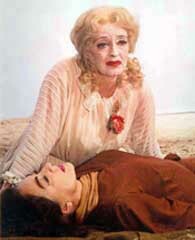 Blanche is lying on the sand with Jane sitting beside her. Knowing that she is near death, she reveals to Jane the truth about what happened all those years before. It was she, Blanche, who tried to run over her sister. However, Jane moved out of the way in time and Blanche slammed into the gate and snapped her spine. Jane was too drunk to realize what occured and has since believed she was responsible for her sister's condition. Now with her mental condition completely deteriorated, Jane goes off to get ice cream cones for the two of them. The cops arrive to find her as she is dancing on the sand...with a crowd surrounding her. Finally, she has the attention again that she has craved. Bette Davis received her tenth and final Oscar nomination for her role as Baby Jane. The success of this movie led to renewed interest in the two leads and both Davis and Joan Crawford began making a cycle of horror films. Davis starred in Dead Ringer and The Nanny among others, and Crawford in gorier fare such as Strait-Jacket and Berserk. Robert Aldrich wanted to reteam the duo and came up with a project written by Henry Farrell, the guy who wrote the novel Baby Jane was based on. It was supposed to be called What Ever Happened to Cousin Charlotte? but Davis had it changed to Hush...Hush, Sweet Charlotte. It wasn't the only thing she changed. Shortly after shooting began, she had Crawford replaced with her friend Olivia de Havilland. That 1964 film was also a big hit.